In Minnesota, it’s nice to have a thoroughly sealed up house in both winter and summer. However, animals also like to stay in warm, sealed up places too. It can be hard to get these critters out of the house, and that is when people should call professional pest control experts and exterminators such as the experienced technicians at Eco Tech. We will eradicate any pests and unwanted critters in your Shoreview home or business, using either traditional or natural techniques according to your choice. 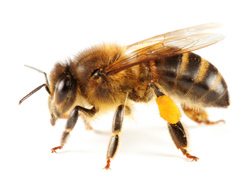 Wasps, bees, and hornets can be very bothersome if they invade your home or establish a large nest on your property. And it is exponentially worse if you or someone in your family are allergic to these flying, stinging creatures. We will eliminate any presence of bees, wasps, and hornets that you have a problem with. And, according to your choice, we can use traditional poisons or take a more natural approach. Fleas are commonly associated with dogs and cats that go outside. Unless these pets have been properly treated, there’s a pretty good chance that they’re bringing fleas into the house. These pests can bite, be hard to eliminate, and can carry diseases. If you have a flea problem, contact Eco Tech immediately for complete eradication of these pests. Raccoons are not the cute, cuddly creatures we remember from Disney movies. No. They are burdensome and violent pests who can make their way into your home and establish a nest in an attic or unused chimney. We urge you not to get close to these creatures. When they feel cornered, they will attack. And it isn’t pretty. Also, raccoons infected with rabies have been known to attack unprovoked. Again, do not get close to these creatures. Instead, contact Eco Tech, a professional pest control company near Shoreview with years of experience in trapping raccoons. If they are suspected of rabies, we will have them checked, and if they test positive, eliminated. Squirrels can make their way into our houses and can be extremely difficult to remove. They can find their way into ductwork and traverse the insides of walls with ease. Eco Tech has perfected the art of trapping these pesky critters and can get them out of your house quickly and with ease. No matter what kind of emergency you have, we will come out and take care of it. Call us any time for immediate extermination services in the Shoreview area. At Eco Tech, we understand the trepidation that comes when an animal invades your house. Call us today for any pest extermination services you need.